Home Loan Manager Pro will help you track your loans, check for errors, review your mortgage costs, plan for the future and set up a plan to be debt free sooner. 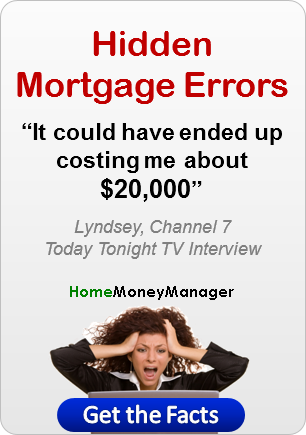 Home Loan Manager Pro has been specially designed to work with the loan details provided to you by your lender. Using the information on your mortgage statements, the software will allow you keep an accurate record of all your loans, instantly check the accuracy of your interest charges, summarize your expenses, and help you plan for the future. With Home Loan Manager you can keep an accurate record of all your loans in the one convenient location. Capture interest rate changes, balances, statement information, and all types of transactions including extra repayments, fees, taxes, and interest charges. The software will let you enter as much or as little historical information as you want. When you first start using Home Loan Manager we recommend that you start with your newest statement first, and then add your older statements at a later date. This is particularly useful if you want to start by importing your transactions and your Internet banking site only contains the latest information. The Balance Checker will confirm that all your transactions and balances have been correctly processed by the bank. The Interest Checker (and Offset Account Checker) will quickly highlights any errors in the interest charges of your loans. If your lender has incorrectly calculated your interest, The Refund Calculator (and Error Compounder) will display the refunds you are due, by calculating the total compounding cost of each error. The Daily Interest Report will show a breakdown of the interest you are being charged on each loan. The Yearly Totals Report will show you the total costs of your loans for ANY year. The Yearly Comparison Report will compare totals between two different years. The Statement Comparison Report will compare totals between to different statements. The Increased Repayments Report will allow you to work out how much you can save over the life of your loan, by increasing your mortgage repayments. The Interest Rate Rise Report will let you prepare for interest rate rises, by showing you the impact on your repayments, and total cost to your loan. The Detailed Payout Plan will let you work out how many years you can afford to cut off your loan, and how much you will save in interest charges. Your Payout Plan lets you decide how quickly you would like to pay off your mortgage, and then shows you exactly what you have to do to achieve it. It works with your current balance and is automatically updated every time you enter your latest loan details, keeping you on track every step of the way. Refer to the importing transactions help topic for more information. To help you get the most out of the loan information you enter into Home Loan Manager Pro, you can allocate categories to your transactions (for example, a transaction may be a FEE, or an INTEREST charge, or a DEPOSIT, or a WITHDRAWAL, etc). You can use the default list of categories, or you can set up your own. To save you manually allocating categories to every transaction, Home Loan Manager Pro provides you with a Category Auto-Matching tool. This tool will automatically allocate categories to new transactions by examining categories you allocated in the past, and by using any category wildcard patterns you set up. Refer to the category auto matching help topic for more information. Home Loan Manager Pro stores all your loan information in a file on your computer called a workbook (with a file extension of .hlnn). Normally you would set up one workbook with all your loans in it, however there is no limit to the number of workbooks you can create. Open the sample workbook and take the software for a test drive. To find a sample account that is similar to your own loan, refer to the sample workbook help topic for a description of each of the accounts in the workbook. For step-by-step instructions on setting up your own workbook, adding a loan, and entering your first statement, refer to the entering your loan details help topic.